You are understanding, generous, follow rules, externally focused, introspective, supporting and nurturing others. You are great encourages of teamwork. You have a deep concern for others and often end up as caretakers. You place utmost importance on helping others grow. You are warm and have a natural desire to be supportive and encouraging. Being charismatic and possessing excellent language skills, they do well in leadership roles. You allows a person to adjust their behavior to the needs of others. Is it the ability to relate and the desire to connect with others with warmth and consideration. It draws others out and responds to expressed or unexpressed needs. However, Your intense and passionate feelings make you hyper-sensitive, You're so interested in pleasing others that you might do things that you don't really want to do, Cannot take criticism at all without becoming very upset, Can be controlling and manipulative and you tend to get in the middle of other people's problems. 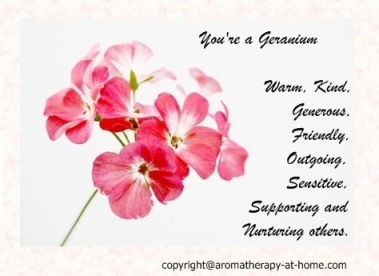 You can use Geranium essential oils (Pelargonium Graveolens) for these positive attributes : consulting, cushioning, friendliness, balancing, soothing, mothering, stability, tranquility and Solace. Also for counteract these negative attributes: anxiety, depression, extreme moods, confusion, sensitivity, tension, overly emotional, hurt, irrationality.